Transfers of funds (TOF) between FOAPALs are only allowed using the same fund number. For full list of exceptions, contact the Business Office. One exception is if you provide support to another PI or campus program, an expense share TOE is allowed between research FOAPALs. It must be allowable on a contract and grant account. Contact the Business Office or your RA for assistance. Awards for travel, research and honoraria are possible to undergraduates, graduate students, post docs and faculty. How they are handled depends on their employment status if any, type of award and if they are at UCSC or another UC campus. The Business Office or your RA can assist you. Most fund transfers will show up in the financial system shortly after processing. TOF requests should be directed to Alex McCafferty (almccaff@ucsc.edu) at the Business Office via email or office mail. Please write clearly or type out the information for easy processing. If you wish to be notified upon completion of the transfer, please note this clearly on your submission. Most expense transfers will show up in the financial system shortly after processing and approval while transfers of payroll expense (TOPE) only post to the financial system once per month and show up a week or so after the beginning of the month. Sometimes it is necessary to transfer an expense from one FOAPAL to another (for example, when a FOAPAL was charged in error). 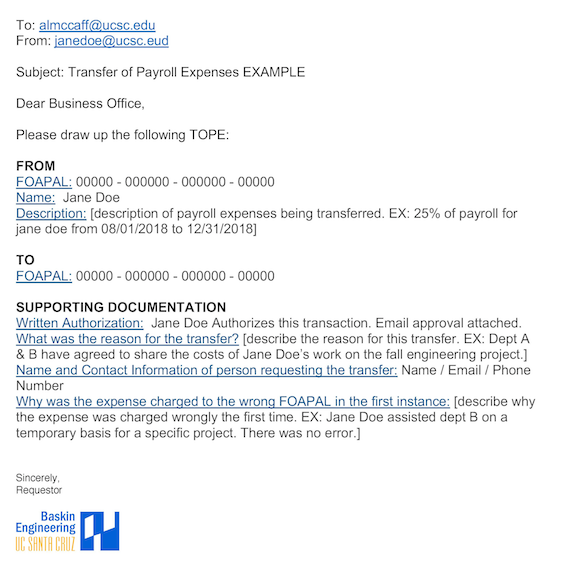 In that case, RA’s or Business Office can enter a Transfer of Expense (TOE) or Transfer of Payroll Expense (TOPE). 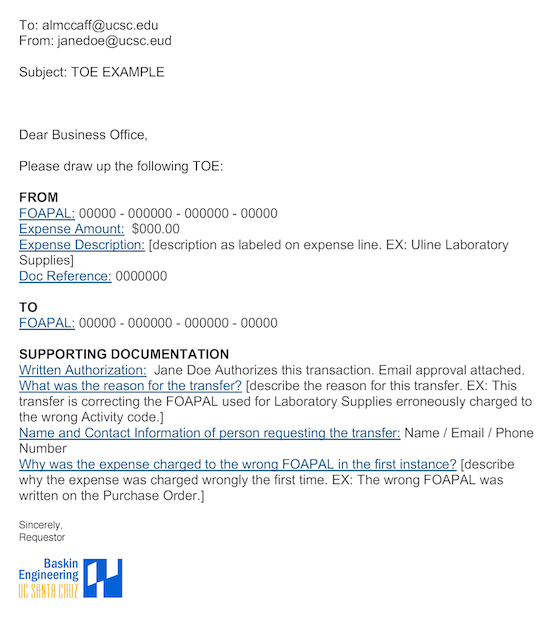 Why was the expense charged to the wrong FOAPAL in the first instance? TOE requests should be directed to Alex McCafferty (almccaff@ucsc.edu) at the Business Office via email or office mail. Please write clearly or type out the information for easy processing. If you wish to be notified upon completion of the transfer, please note this clearly on your submission. Clear information as to what payroll expenses are to be transferred including FOAPAL information, name of employee and description. If a percentage is being transferred, please note this. 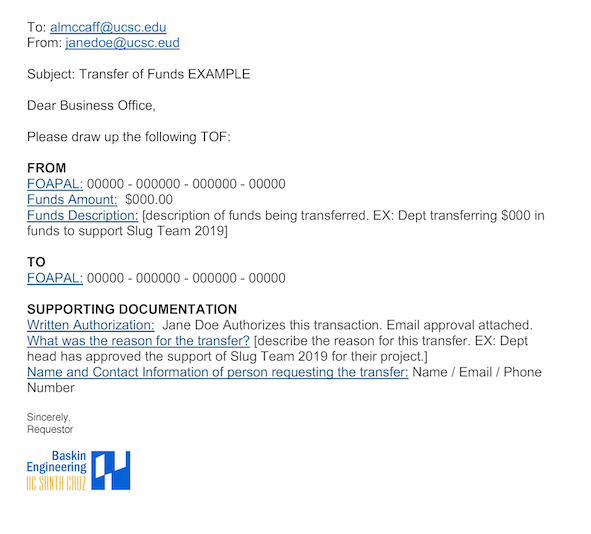 TOPE requests should be directed to Alex McCafferty (almccaff@ucsc.edu) at the Business Office via email or office mail. Please write clearly or type out the information for easy processing. If you wish to be notified upon completion of the transfer, please note this clearly on your submission. Relate to individual items of expense or funding. Refer to a source document in detail sufficient to link the transfer to the original funds or expense. Be the same amount as originally recorded or an appropriate portion. Have supporting documentation for the purpose of the transfer, not the original charge. B. What was the reason for the transfer? How does the expense fall within the scope of the FOAPAL? E. Why - why was the expense charged to the wrong FOAPAL in the first instance? The Business Office or your RA can assist you with developing the required supporting documentation. Payroll expenses can also be moved between FOAPALs, same documentation needed as above.